Beautiful weather on Saturday but not much of a bite. I had a few clients onboard Saturday and we opted to search for a gator trout instead of working the mixed bag catch we've been working lately. Well, the past few days have been abnormally warm and today was no different. Probably reached 65 degrees by 10am. The water temps in the river were back up to 60 degrees and I think it's got the trout a little confused. They weren't holding in their normal Winter haunts. We put about 4 hrs in for a 13lb Gar and several flounder then decided to call it quits and head back to Swansboro. Sorry about the lack of bite guys... doesn't happen very often. I dropped the boat back in the water in Swansboro late in the afternoon as it was too pretty to head to the house. 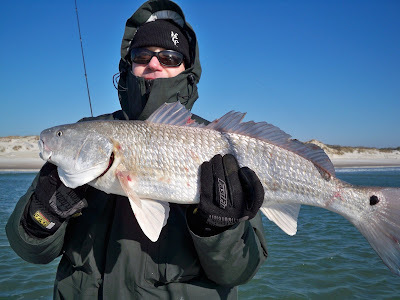 I searched for a while and finally found a good school of redfish in the backwaters... the warm temps over the week have brought many of the redfish that normally roam the surfzone back into the internal waters. The ICW and feeder creeks were 64degrees this afternoon. If it stays warm, finding reds inside shouldn't be a problem. Once it get cold again it'll be onfire along the surf! Well, I had a client booked for this morning hoping to get into the surf with the 25mph WNW winds but just after daybreak I checked out the surf and it was a "No Go" situation. There was still plenty of whitewater hitting the beach. I called my client and with temps/ windchills below freezing and winds that would make it difficult to fish inside we decided to postpone the trip.... WELL, WOULDN'T YOU KNOW..... since i was on the water already.... I eased around and tryed a couple places I saw reds on Sat. and one of them was stacked with 22 to 26in reds.... I released 11 reds from 7:30am till 8:15am... and then got tired of the wind and the bone chilling cold.... I'll get you on those fish soon enough Ricky. They're there, but you wouldn't have enjoyed it due to the extreme wind/cold. Sat. Morning I had the Umstead crew onboard from Goldsboro. 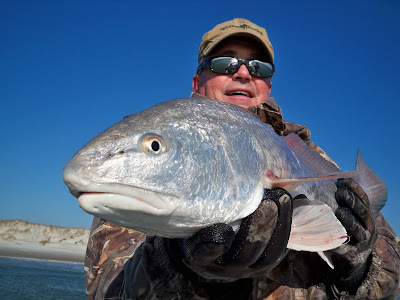 We were hoping to get into the surf zone to play with the large schools of Redfish but, there was still a big swell rolling in from offshore with the Southerly blow on Wed. and Thurs. The weather was actually pretty good though, and we opted to do some River fishing. We made the run up the river and began working an area I've been catching a few Speckled Trout lately. Within a couple minutes we had some fish hooked up. The trout were small today ranging from 12 to 17in. but we managed some action. We spent a good 4hrs. working hard with Gulp Pogies and wound up landing 8 Speckled Trout, 6 flounder, 1 puppydrum, and a nice 23in Striper weighing 4lbs. The Striper had a Yellow DMF tag. The bite was a little slow today but, it was very nice to get back on the water after a couple days of sorry weather. Great job today guys.... sure beats being in the office. Enjoy the fish! 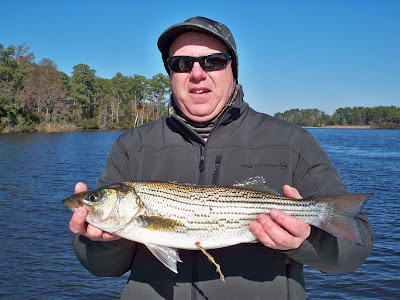 Sunday, Mike and I shot over to NewBern to check out the bite on the Neuse River. We got a late start, hoping to shoot a show and stay on the water for the evening Striper bite. We began working several of the creeks off the Neuse on both shores. No big fish today but the creeks offered up a mixed bag of Speckled Trout up to 2.5lbs, Flounder up to 15in., and Redfish. 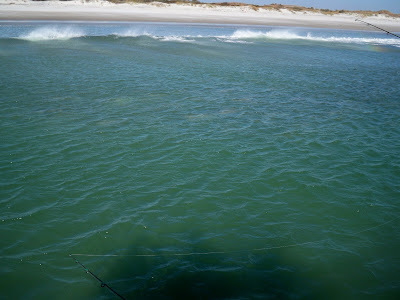 We put our time in and wound up with 12 Speckled Trout, 5 Flounder, 1 Redfish, and 4 striper. The better Striper were between 21 and 22in. and struck during low light just before sunset. Keep an eye out for this show to air this upcoming Sunday, December 21st. What a morning! This morning I had Rob Prewitt and Dave Harsant onboard. Rob called me recently sounding very excited wanting to get in on some of the extreme Winter redfishing Mike and I are always talking about. After checking out the weather, I told Rob that Sunday was going to be perfect, even with the 20 to 25mph winds and cold temps forecasted. These guys were tough, hopping on just after daylight with wind chills below freezing. We eased away and into some creeks while we gave the sun a chance to rise into position. We landed three small reds in the creeks in about a half hour of fishing and then moved out to the shoals and began searching. It took about 15 minutes to locate the first school of fish, which had approx. 500 reds ranging from 23in. to 26in. The fish were feeding very well despite the early morning cold water temps. We caught about a dozen off the school and then left them to some other recreational fishermen that arrived and we moved on to locate a bigger school. Over the course of the next couple hours we found 3 more schools of Redfish with the largest school between 3000 and 4000 fish ranging from 24in. to 30+in There were some pigs in this school... We released about 75 Redfish, unharmed, to bite another day and Rob and Dave obviously had a great time. 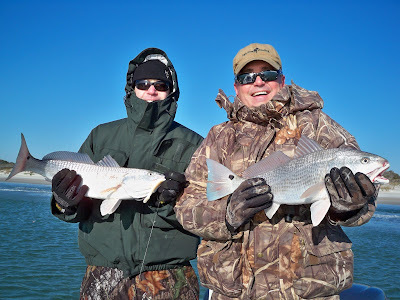 This type of fishing will bring out the kid in ya... and congrats to Dave on his first Redfish ever!.. 2nd, 3rd,... oops, lost count! 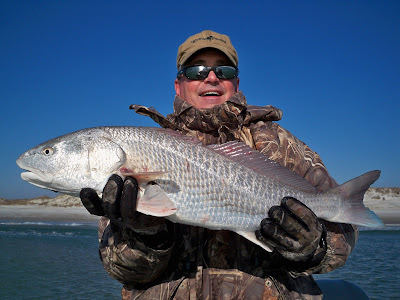 Folks, the Winter offers up some of the most exciting Redfishing with amazing numbers of catch and releases. Both Capt. Mike and I will be offering these trips all Winter! 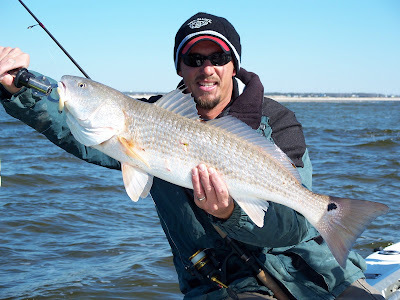 All you need is 4 to 6hrs to possibly set you're new personal record of Redfish releases in a single day!